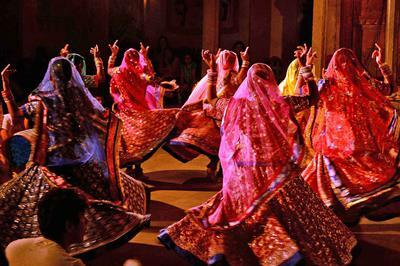 Rajasthan’s traditional song and dance show. Our recent trip to Rajasthan in November last year, took us to Udaipur, a hidden jewel with its breath taking and mesmerizing Rajasthani folk dance performances. It was nearing sunset as we drove into Udaipur from Jodhpur. The options we had were to either crash at the resort or visit the famous evening Dharohar dance and culture show at the heart of the vibrant city of Udaipur. I am glad I chose the latter. The beautiful Bagore Ki Haveli hosts the best and most convenient opportunity to see the folk dances of Rajashtan, with colourful night shows of energetic regional dances which include Rajasthan dances of Western region, Bhil and Marwari dances, as well as the traditional Rajasthani puppetry. Dharohar is the name of a cultural event held in collaboration with west zone cultural center (WZCC), every evening inside Bagore Ki Haveli, a magnificent 18th century building, in Udaipur. The rationale behind including several zones in a specific zonal cultural centre is to provide a cultural interaction amongst these states. Dharohar” means “Heritage”, and the show makes your grandest dreams a cultural euphoria. This programme has been initiated to celebrate the cultural heritage of this state of Rajasthan. It endeavours to envelop you in the colours of Rajasthan. Proceed with your guide to the cultural extravaganza performed on the premises of Bagore Ki Haveli on the waterfront of Lake Pichola.We rushed to get a good seat for the evening show, what with our driver breaking traffic rules to take us there on time! This cultural show is a captivating mix of Rajasthani folk dances, songs and puppetry held every evening from 7pm to 8pm at Neem Chowk inside Bagore ki haveli for the past 10 years. Witness the Dharohar Folk Dance Show, exhibiting seven traditional dances of Rajasthan. The enchanting music of Rajasthan, the stunning performance of Jaisalmer folk dancers, gleaming dresses from the land of Maharajas, and entertaining puppets in the hands of masterful puppeteers, create an amazing experience for the audience. The organizers aim this art of folklore alive, by providing a platform for the Rajasthani artistes to demonstrate their cultural heritage to the public. People sit around the yard and the performance takes place right next to the audience. The show starts exactly at the scheduled time – 7pm in the Neem chowk. The terrace has a full-grown Neem tree right in the middle and the seating arrangements are good, with cushions (‘gaddas’) placed around the 3 sides of the terrace to allow a good view of the dances. The surrounding balconies are lit up in different colours and the pleasant November evening and the star-lit sky makes it even more beautiful. With a mix of Mewari, Bhil and western Rajasthani dances, this musical concert is performed by talented performers in the middle of the well structured courtyard of Bagore Ki Haveli. The show starts with a welcome song (’pdharo Mhara Des”), rendering a hearty welcome to the audiences in a traditional way. A short and informative introduction by a turban wearing person anchoring the detail introduction of folk dances of Rajasthan in both Hindi and English; followed by the beating of a drum; and blowing of a shankh (conch shell); kicked off the evening show. The cozy Neem Chowk soon turns into a stage of colorfully dressed artists, and the show begins. The commentary, giving a detail introduction of each show, both in English and Hindi is par excellence. It is fascinating to see how each dance is greatly intertwined with the reality of life for the people of Rajasthan and is performed with complete dedication and sincerity. The beautifully clad female dancers in traditional costumes with bright coloured cholis and embroidered glass, work, turn and whirl around with other counterparts giving a titillating performance. They perform in accordance with the beats of tabla and harmonium and this is one of the most exclusive and interesting dance shows which not only presents culture but also talent. The verve and energy crackles throughout the show. Gavri Dance: This most popular southern Rajasthani ritual, a fusion of act and dance, reflects the divine perception of the Bheel tribe. The performers enact a vigorous fight between Goddess Amba and Demon Bhiamwal and finally the dance ends with the conquest of good over evil. The energetic background music and colorful costumes mesmerize the atmosphere. pots are blazed with cotton seeds dipped in oil. A well choreographed and a great music coming from bankia (musical instrument) generates electrifying waves in the audiences. I was completely stunned! Terah Taal Dance or Manjiras and Knife Dance: Originating from Kamada Tribe of Rajasthan, dancers tie musical instruments called manjiras on different parts of their body and play it in thirteen (Terah Taal) different styles. The dancers have their hands and legs clad with beautiful tinkling bells and these bells along with the music, produces wonderful music. The later part of the dance consists of the performers holding knives in their mouths and brass pots on their heads and performing in such a way that keeps the audience spell bound. Katputli (puppet) show –To break the monotony of the dances, the Dharohar dance show is interrupted by the traditional Rajasthani Puppet show. Rajasthani art and music is definitely incomplete without a puppet show as it has its own uniqueness and individuality. Here in Dharohar, both, the puppets and the puppeteer perform in front of the audience which gives equal acknowledgement to the puppeteer as well as the puppets. This puppet show presents comical skits which refresh the viewers’ moods. We see the magician puppet that can even pick his head up thereby detaching it from the torso- funny and entertaining! Gorbandh Dance: is an exclusively ornamental type of fun filled dance with female performers whirling around very fast to the rhythms and beats of music. The performers wear the ornaments which are customarily worn by the camels. Ghoomar Dance: was developed by the Bhil tribe and was then adopted by other Rajasthani communities. It is performed by women in swirling robes, with the accompaniment of songs sung by both, men and women. This folk dance derived from ‘ghoomna’ (pirouetting) which displays the spectacular colours of the flowing ‘ghaghara’. There is an amazing grace as the skirts flair slowly while the women twirl in circles, with their faces covered with veils. The dancers use measured steps and various graceful movements of the body; beating palms, or snapping fingers at particular cadences while singing lilting songs. Traditionally Rajput ladies perform this dance during events meant exclusively for ladies. The dance movements get faster with the increasing speed of music, leaving the entire audience thrilled and excited. Bhavai Dance: at Dharohar is the last and the longest performance by a single experienced artist. This dance form has its origin in the deserts of Rajasthan, where women have to tread long distances from their homes to fetch water from wells or oasis. This dance represents the gratification of a Rajasthani woman when she gets water in the desert after a tiring long walk. While returning they carry many water vessels together on their head and the joy of getting water certainly makes them forget the pain of carrying the huge weight over their heads. This happiness is a message in form of Bhavai dance. 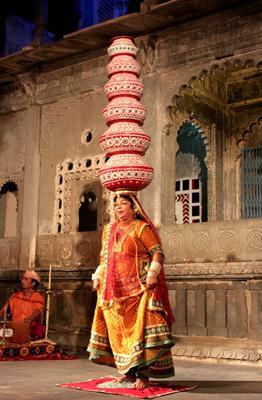 The dancer starts the show balancing two pots on her head, and as the dance progresses, additional pots are added till they are 11 in number! And as though this is not enough the dancer, a very refined and senior artiste of 70 years, M/s Jayshree Rao dances on the edge of a metallic plate and subsequently on sharp cut pieces of glass, all the while balancing the pots without any fear or pain. This excellent talent undoubtedly requires persistence and hard work. There is standing ovation from the audience, which is what M/s Jayshree Rao deserves, an elderly lady of 70 years! I have never seen anything like this before! Indeed the highlight of the evening was the Bhavai dance performed by Jayshreeji. Should you ever feel like taking some steps back and going into the historical moments of traditional dance and culture and breathe the air of bygone era, with some heart touching moments that will take you back to those days then trust me Bagore ki Haveli’s spectacular performance is the best! Besides the show there is a small exhibition which will help you buy some memorable items. If you are interested, you can even purchase your favourite puppet at the end of the show for a very reasonable price. The money that is raised by the tickets and merchandising goes entirely to the artists as well as to the projects for the development of Rajasthani folk music It is advisable to reach for the show 30 minutes prompt. Colorful stage with lights and skilled traditional Rajasthani folk dance and music performers are surely going to take you into the wilderness of delirium!